Solar thermal comes in many different system designs depending on many different factors, here are some examples of solar designs and there most common uses based on building or usage. 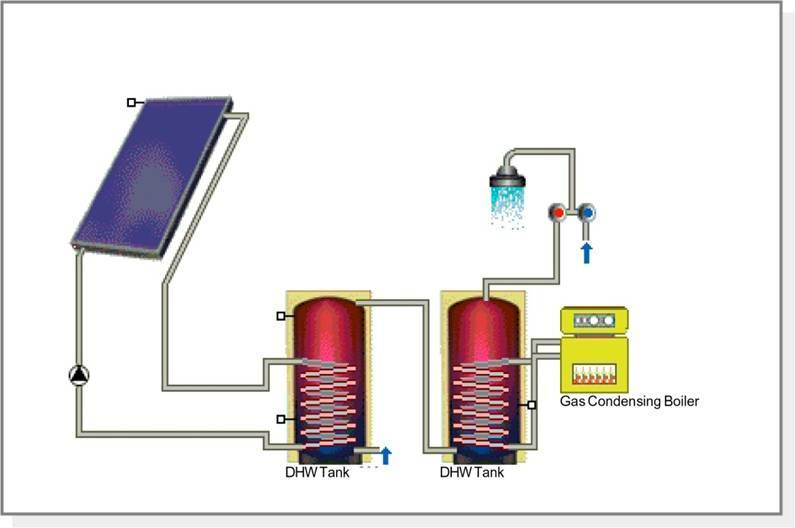 This is a very common way of installing solar thermal systems in commercial buildings, the DHW tank can be any form of hot water generation like direct fired water heater or a coiled cylinder like the image. 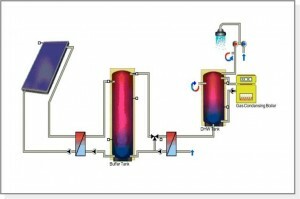 The advantage of this system it is very easy to retro fit, the water is preheated going into the cylinder and the boiler controls registers the higher heat and does not fire the boiler. The main disadvantage of this system is there is a legionella risk if the preheat tank is not pasteurized once a week but this will reduce the efficiency of the system. This type of system is used for solar thermal systems above about 75m.sq and for any location with that require a zero legionella risk like hospitals and care homes. 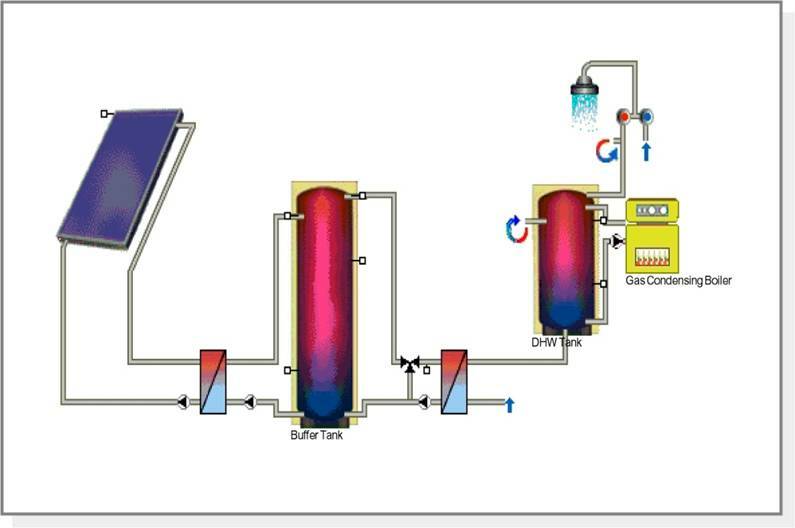 The use of the plate heat exchanger on the hot water circuit means that there is water large volume of water stored at dangerous temperatures ie. below 55 degrees. The system is very efficient and can deliver pre heated water to any type of hot water generation system. 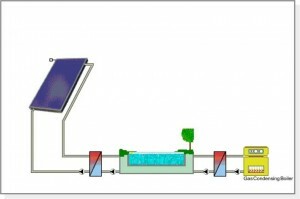 The disadvantage to the system is the added installation cost due to the extra pumps and complicated controls system. 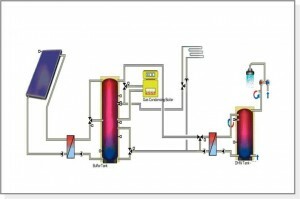 Solar Thermal space heating is often requested but is very expensive. It only works with low temperature heating systems like underfloor or wall heating. A very large array is required to collect the energy in the colder times of the year. It only works in the heating shoulder period of Oct/Nov and Mar/April were heating demand is low and there is still sufficient solar gain available. It is recommended the system is installed with an outdoor swimming pool to utilise the oversize array in the summer. As you can see from the diagram solar thermal for swimming pools is one of the most simple ways of installing a solar system. You can install the system using a tube or plate heat exchanger depending on the size of the swimming pool. With the use of a cover a solar thermal system can often cover over 50% of the years heating requirements.